Thera, the southernmost island of the Cyclades, is situated relatively close to Crete. It is one of the most important locations worldwide for the study of volcanic geological phenomena and formations. Initially the island was circular with canals which connected the interior lagoon with the sea. Its surface was cut by deep crevices and steep ravines. The island was transformed during a major volcanic eruption in the sixteenth century BC, when much of It was submerged. This subsidence created a large hollow, the caldera, into which the sea flowed. Therasia and Aspronisi are the two islands that complete the caldera's rim to the west. After many centuries and because of the continuing volcanic activity, two more islets, Palea Kameni and Nea Kameni, also emerged. The important Bronze Age settlement of Akrotlri is located on the south coast of Thera. Scant evidence suggests human activity there during the Late Neolithic Period (fifth millennium BC). Akrotiri was a prosperous settlement during the Early Bronze Age (Early Cycladic Period, third millennium BC), which continued to develop into the Middle Cycladic period (early second millennium BC). At the time of its destruction, in the Late Cycladic I (sixteenth century BC), Akrotiri was a thriving port town in touch with the major centres of the Aegean and the Near East. Its grand, well-appointed houses were beautifully decorated with fine wall-paintings with primarily religious themes. The abundant pottery is decorated with images of the land and sea, reflections of the culture buried beneath the ashes of the Theran volcano. Volcanic ash covered the buildings and their contents, perfectly preserving them for the amazement of the modern visitor. Akrotiri has rightly been dubbed the "Pompeii of the Aegean". In 1939, Professor Spyridon Marinatos (1901-1974) put forward the theory that the Theran eruption brought on the end of the Minoan civilization in Crete. 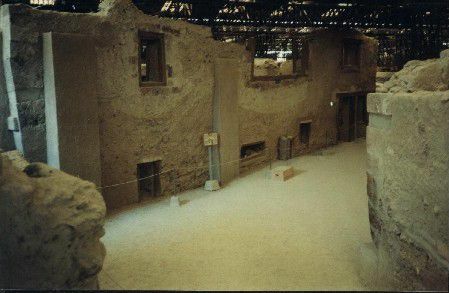 His excavations at Akrotiri (1967-1974) revealed the well-preserved Cycladic settlement of the sixteenth century BC, with multi-storeyed buildings and an abundance of artefacts. Marinatos research at Akrotiri was his life's work and a landmark in Aegean archaeology. Although his theory of the devastation of Minoan civilization by the Theran eruption could not be proven, his fascinating discoveries most vividly illustrate a society that was open to foreign contacts and influence, while maintaining its own tradition and character. Since 1974, the Akrotiri excavations are directed by professor Christos Doumas.